Daily Spirit & Word: 814: The Meaning of Immanuel. I’m praying now for all those who’ve been affected by this disaster. It’s a word we hear every Christmas, but like a lot of religious words, we’ve lost its meaning somehow along the way. Or if we do know what it means, the impact of that meaning is not hitting home. Because of all the hustle and bustle and the haste to buy stuff, far too many Christians aren’t looking forward to Christmas, but we can re-capture the MAGICAL feelings we had as children, all the excitement, joy and wonder of Christmas. It happens as we experience IMMANUEL for ourselves. 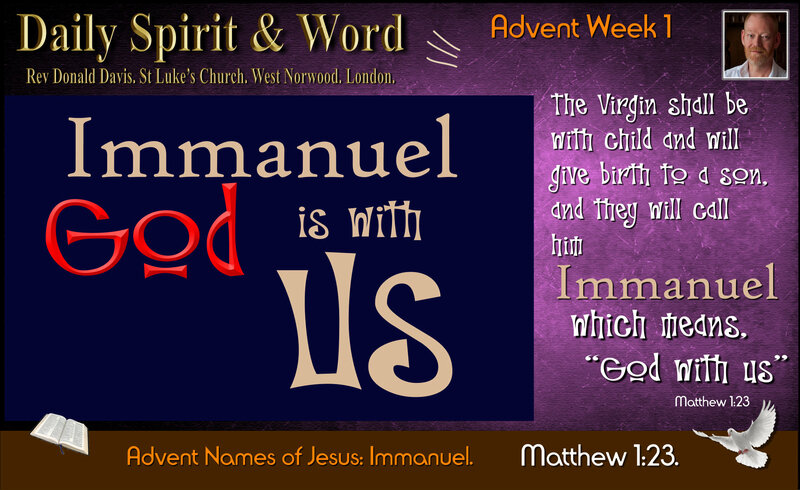 Immanuel means: “God with us”. This is a quote from Isaiah the great Prophet of the LORD. Isaiah 7:14. When Jesus was born, he was a baby human being, he became one of us, but He was also still God, just wrapped in flesh. Now when you dwell upon that fact, The CREATOR of the whole Universe and time itself, came to Earth. Out of all the billions of little planets, he chose EARTH to come and reveal Himself to His Creation. Awesome! Of course He came for a reason, Jesus was coming on a rescue mission. It’s a bit like the Government sending in the SAS to set free the prisoners held hostage by the Iranian Terrorists in the Iranian Embassy in London in the 1980’s. LINK in that BBC News coverage you’ll see them storming the burning building. Jesus, of course, didn’t come with guns blazing, smoke going off and bombs sounding, nor did He arrive with an army to win His battle, instead Jesus came and Heaven burst into song and God let the Shepherds experience Heaven for a moment. Jesus Christ, the King of the Universe gave His life upon the Cross for all mankind to be set free. However, his birth and death was even more dramatic than that SAS rescue. He was publically executed, with the crowds watching. Alongside at least two others that day Jesus public humiliation and death was a victory. Though the world at that time didn’t realise they’d just killed Immanuel: God with us. However, we know that His death was not the end, because just three days later, Jesus, because He was always God, came back to life again. His mission was completed and His body is alive today in Heaven where He ascended over 2000 years ago. The next time anyone is going to see Jesus, apart from in visions and dreams, is when He returns in all the glory of Heaven. But before Jesus comes back, we’ve been given an opportunity to get to know Him. We can know Immanuel, God with us, personally right now. We can experience God and know God… Have you had your own Immanuel? Do you know, beyond a shadow of a doubt, that God is with you? Once you experience Immanuel for yourself, nothing will ever be able to take away that experience, it will transform you life forever. Because God becomes your Immanuel, Jesus promised this very thing for everyone who believes and trusts in Him. Once Jesus comes into your life, He comes in TRINITY: Father, Son and Holy Spirit. Your own body becomes the TEMPLE of God, because wherever God is, that is His Temple. When He comes as promised, that is your Immanuel moment, but it lasts forever. You’ll know Him, if you LOVE Him. You’ll know if you love Jesus Christ. When you hear his name, your heart skips a beat. It’s like He’s inside you witnessing within, that He’s here. Oh yes, you’ll know if you love Jesus. Nobody needs to tell you when you are in love with another person, your heart, mind, will and strength are for that relationship. You’ll do whatever you can to be with your lover. When you are apart, you’ll always long to be together. I knew when I was in love with my soon to be wife Julie, because I was over 200 miles away, and all I longed for was the evenings when I could get to a telephone box (no mobile phones in those days), to call her at her house. We’d spend ages chatting about nothing on that phone, until my money ran out. When you are together, its like you are in the place that you’ve always belonged. All you want to do when you are in love is hold that person as close as possible, it’s like the two have become one. That’s real LOVE! That’s how you know you love Jesus, when you are ONE with Jesus. When Jesus is your LORD, then you will be prepared to do whatever He tells you. It won’t be a burden to you to be obedient to Jesus, because you’ll be in love with serving Him. He’s your beloved King and you’d willing die in His service. You’ll know if you’ve submitted your life to Him, because your desires will be changed and you’ll want to live in obedience to Jesus commands and teachings. That’s how you know if you’ve experienced Immanuel for yourself. So HOW do we get our own IMMANUEL? “Come, oh come Immanuel…” (The Christmas Carol). Invite the LORD to come into your life right now. Believe in the LORD Jesus Christ: It’s easy to say, “Oh yes, I believe in Jesus”, but that doesn’t mean that you are BELIEVING IN Jesus; i.e. trusting that He has died upon the cross for your sins and that you’ve received Him as your Lord and Saviour. In order to do that, you’ll first need to be CONVICTED by the Holy Spirit that you are indeed a guilty sinner. Confess any known sin in your life. Confession means to own it, to acknowledge that it was you, that you are guilty of sin. It’s like a prisoner standing before a judge and he asks the person in the dock, “How do you plead?”, when you’re ready to confess your sins you’ll respond to the Judge of the Universe, “Guilty as charged your Honour”… If you are not convinced you are a sinner, then GOOGLE the Ten Commandment; you’ll soon see your guilty heart. They are like looking into a mirror, they reflect the condition of your heart. Those commandments of God, not suggestions, are still applicable today. God has not changed, His standards of Holiness will always be the same. The Holy Spirit will show you your guilt, that you are a sinner, that you are not righteous enough and that one day the LORD is going to judge you. How will you plead today? Like the rest of us, like every sinful soul on earth, you’d have to say, “Lord, You know all things, You know that I’ve sinned”… However, if you have received Jesus as Lord and Saviour, then all your sins will be washed away, you’ll be clean, your conscience will be clear and you’ll approach the Throne of Judgement with boldness, knowing that you are a forgiven sinner who’s been washed in the blood of God’s Holy Lamb. If you’ve believed, repented, renounced sin and received Jesus as Lord then you’ll already have been made into a Saint by Jesus Christ, the Bible calls that SANCTIFICATION (Being made into a saint, by trusting in Christ). I’m writing all of this today, because I want every reader to know and experience their own Immanuel moment, that time when you purposefully turn from sin and trust in the Lord Jesus Christ as your Lord and Saviour. I’m praying that everyone I know and love will come to Jesus and experience Immanuel for themselves. I’m praying that Holy Spirit will give them a soft heart to be open to God. I’m praying that He will convict them of their sinful condition. I’m praying that He will show them there is a judgement to come. I’m praying that He will reveal to them, the way of Salvation. I’m praying that He will show them the life of Holiness is a joy filled life. I’m praying that He will give them a desire for freedom. I’m praying that He will give them a hunger that this world cannot satisfy. Father I’m praying all these prayers for those that You love and that I love in the Name of your Son, my Lord and Saviour, Jesus Christ. Amen! And I am full of faith, expectancy and sure and certain HOPE that You will answer my prayer Father, because I’m believing Jesus’ promises. John 16:24 (NIV) “Until now you have not asked for anything in my name. Ask and you will receive, and your joy will be complete.” Amen! Join me in praying for all those who are grieving because of that plane crash in Brazil. 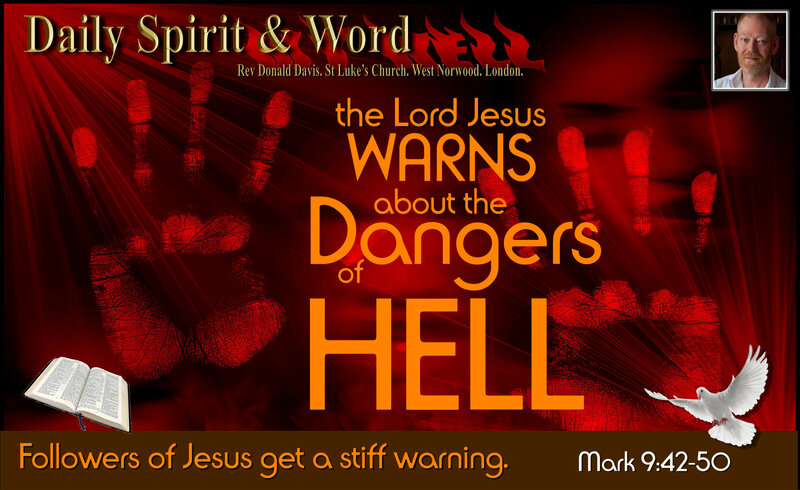 Daily Spirit & Word: 783: Jesus Warns About The Dangers Of Hell. Well, it begs the question: Will God, who is loving, kind and forgiving send people to Hell? Those people who say such things are right, their ‘god’ wouldn’t, but the God of the Bible tells us that His angels will. Someone cautioned me once, “Don if you are ever going to teach or preach on the subject of Hell, do it with tears in your eyes”… I’ll never forget that, I didn’t quite fully grasp his meaning at first, but after years of working with people for Jesus, I can see what he means. It’s getting God’s heart for people. Knowing God and His love for people. His desire that He doesn’t want a single soul to end up in Hell and the reality that most people will be going there, because they reject Jesus and the Gospel. It does make me cry. You see it’s only modern man who has a problem with a judgemental God: The Bible reveals God in fullness; His love, His Justice and His mercy. Previous generations didn’t seem to struggle with it as much as we do. In our modern society, we view all forms of PUNISHMENT as evil. We should NEVER hurt another individual, because it’s UNLOVING to do so. (Quite right, there are other ways to help people see the seriousness of their crimes, than merely punishing them). However, God is not like us. His ways are not our ways. He is kind, gentle, loving, forgiving, generous, but He’s also full of rage and anger against sin and rebellion. He hates it when people hurt each other. And we would most certainly agree that we must be PEACEMAKERS wherever we can be an influence for Good in this world. 4 “I tell you, my friends, do not be afraid of those who kill the body and after that can do no more. It’s a dreadful, fearful, horrible thing to fall into the everlasting arms of God who is angry with your sins. That’s who we should be afraid of seeing with sin still in our lives. When we look at our passage from the Bible today from Mark’s Gospel: We’ll see just how serious Jesus viewed SIN and it’s consequences. The SIN Jesus is alluding to is the Sin of Pride in life: Thinking they are better than others, this only leads to strife, competition and rivalry between each other. Remember the CONTEXT: (Go back just a few verses to see what Jesus is talking about). Unfortunately, if you also read on in Mark’s Gospel, you’ll see they didn’t get this teach or the warning: Because they’re still trying to have the best place Mark 10: Peter and John’s request. (More about that later). My friends, Jesus is again teaching His own Disciples about: Strife, Rivalry, amongst themselves, He’s not going to be with them forever, so He must get this point home and into their heads in the most serious and pointed way he can… So Jesus warns them of the consequences of this kind of SIN: It’s going to be HELL for you… Unless…. Unless you CUT IT OUT of your life. 42 “And if anyone causes one of these little ones who believe in me to sin, it would be better for him to be thrown into the sea with a large millstone tied around his neck. (Notice: The NIV leaves verses 44 and 46 blank). 42 “But whoever causes one of these little ones who believe in Me to stumble, it would be better for him if a millstone were hung around his neck, and he were thrown into the sea. 49 “For everyone will be seasoned with fire, and every sacrifice will be seasoned with salt. “Their worm does not die”: The soul is eternal. Once you are born you will live forever in eternity: Either in Heaven or in Hell. “The FIRE is NOT Quenched“: The fires of Hell are Eternal. Some modern theologians are not happy with ETERNAL Punishment in Hell. They, again, believe that their “god” wouldn’t send anyone to hell forever. Perhaps if there is a Hell, then it will only be for a short time of purification. Then the prisoners in hell will be released into Heaven. Well, these ideas sound fine and tolerant and kind, but they are not true or ultimately loving. Because, people are not bothered about death, the love of life is diminished. If hell is not real, then there would be no point in Jesus dying upon the Cross. If there are no consequences for sin, if hell is not real, then Jesus Father must be very cruel indeed… However, if hell is real, and Jesus did die so we could be set free from sin, then God is the most loving being… He is! Hell is real! Jesus did die for the sins of the whole world. However! That’s not what Jesus thought or taught though: Jesus is God and He clearly warns of the dangers of being thrown into hell. For Jesus, once you are in Hell, there’s no escape, there’s no way out of hell. Hell is forever. The soul is eternal, once you are born into this world, your soul lives on forever. There are two places we will go when we die; one is to be with the Lord forever in Paradise, Heaven. The other is eternal Hell and tormented by Satan. The reason we’ll get into Heaven: Not because we’re good or have done enough good. Why? Because just ONE sin will be enough to keep us locked up in Hell forever. The only reason anyone will ever end up in Heaven is if they’ve Trusted in Jesus Christ as Lord and Saviour: Having had their sins removed by His death upon the Cross. The reason we’ll get into Hell: If we die in our sins. We’ll be carrying our sins with us, and the weight of our sins will pull us all the way into Hell forever. We’d all agree that Jesus was the most loving person who ever walked the earth; yet Jesus had very strong words for His own followers, warning His own Disciples of the Dangers of Hell: Causing one of these little ones, who believe in me, to sin… You’d be better off having a large mill-stone tied around your neck and be cast into the sea, than to face God having caused someone to sin. Oh how we need to stop blaming other things for the sins we commit; it’s not our environment, our upbringing, our genes, it’s us, it’s me who sins. I do it when I give into temptation, when I’m not being self-controlled, when I’m influenced by Satan or demons. We’re tempted to sin when we give into our desires. All sin is rebellion against God: It’s going against our conscience: It’s breaking at least one of God’s Ten Commandments. Sin stains our souls and that stain cannot be removed by trying to be good. You will experience the fire: Fire is a form of purification: Even though you will go to Heaven if you’ve believed in Jesus and trusted Him as Lord and Saviour: You will experience a judgement:(The Believers Judgement 2 Corinthians 5:10) It will be like one escaping through the flames. Note: This is not the same judgement as unbelievers: We who’ve trusted in Jesus, will not be judged like that. We have already passed from death (Hell) to life (Heaven). Our place in Heaven is secure, but we will be rewarded for the good we have done and purified from any remaining, un-confessed sin. John 3:13-21. You will be singed (scorched with fire): the amount you will be singed will be determined by how much sin you are carrying since you came to know Jesus Christ as Lord. You must repent of sin right now: you don’t know if you are going to die tomorrow. I don’t want to see lots of people that I know and love, in Heaven with singe marks all over their souls. When you repent, you will once again be on fire with love for the LORD. It makes me cry so much when I think of all those lovely Christian brothers and sisters who’s lives have been overtaken by sin. Yes they will probably be saved, if they are truly born again of the Holy Spirit, but Jesus didn’t die just to forgive us our sins, He also wants us to experience the abundant life now. You will never experience the fullness of the abundant life as long as you are hanging onto your sinful choices. You can’t serve God and serve your pleasures: you will hate the one and love the other. So my friends, get right with Jesus, repent and trust Him again. Turn from sin in your life and return to the LORD. What happens when SALT looses it’s ability to savour? The man asked me, “Do you want salt and vinegar?” It was a strange question to me, I couldn’t imagine eating fish-n-chips without salt and vinegar… “Oh yes please, lots of salt and vinegar”… However, when I put one of those chips into my mouth, it was bland, no salty taste… I put another in, the same thing. I went back and asked for more salt… Nothing… The salt had lost its ability to savour… I’d never experienced that before… Salt that wasn’t salty…. That’s what we’re like when we purposefully walk away from Jesus and choose to live in sin. How’s your unity and love for your brothers and sisters in Christ? Have an AWESOME week with Jesus Christ. I don’t want to see any of my friends with a large millstone around their necks and struggling in the deep sea. I don’t want to see you with no hand, feet or eye. I don’t want to see you in Heaven with singe marks on your soul. I don’t want to see you falling out and falling over each other. Oh my friends, let us get closer to Jesus today. Admit our need for His forgiveness and walk with Him in the power of the Holy Spirit. Amen! Finally, believe in Hell: It will give you a wake-up-call. It will give you a desire to see others being saved by Jesus. It will enable you to live a life of freedom in Christ Jesus. Hell is real, Jesus believed it, taught about it’s reality and warned His closest and most dearly loved followers about it. Quotes: In a world of psychic hotlines, horoscopes, Wicca, and alternative spirituality, Christians must be able to share their beliefs effectively. They must proclaim clearly, consistently, gently, and lovingly, the possibility of heaven and the warnings of hell. Apologist Peter Kreeft addressed the fact that ignorance or denial of the biblical teachings about hell comes often from within the church. “Of all the doctrines of Christianity, hell is probably the most difficult to defend, the most burdensome to believe, and the first to be abandoned.” P. Kreeft and R. K. Tacelli, Handbook of Christian Apologetics (Downers Grove, IL: InterVarsity, 1994), 282. 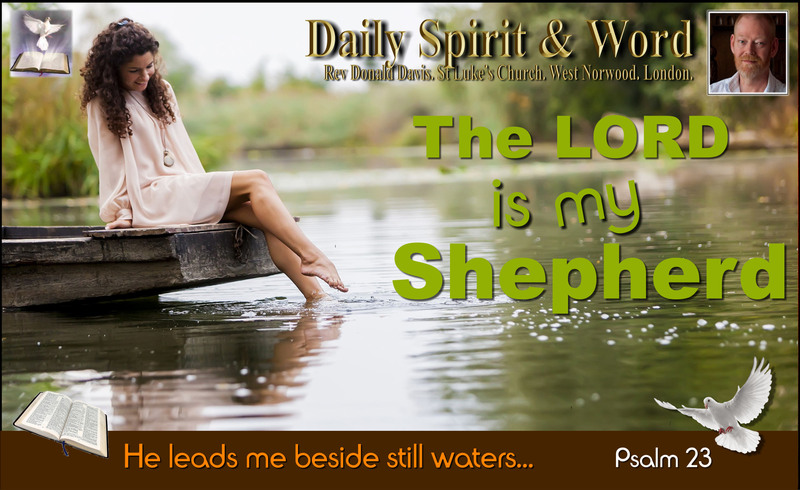 Daily Spirit & Word: 765: The LORD is My Shepherd. Good morning my friends, it was such a wonderful privilege to conduct the funeral of one of the oldest saints in St Luke’s Church, June Bailleau. She died in full assurance that Jesus Christ was her Good Shepherd. So we could celebrate her life and be comforted with the assurance she’s gone home to be with her LORD forever. There were awesome testimonies about June, the kind of woman she was, her dedication to the Lord, her love and service in church and community, but most importantly how she longed for everyone she knew to come to the point of knowing Jesus for themselves. She wanted me to proclaim the Good News of Jesus at her funeral. So I did, here’s the message that I gave. A few days before she died, June couldn’t speak clearly, but she mouthed the words of this Psalm perfectly from memory as I read it out to her. The LORD is my shepherd; I shall not want. He maketh me to lie down in green pastures: He leadeth me beside the still waters, He leadeth me in the paths of righteousness for his name’s sake. Yea, though I walk through the valley of the shadow of death, I will fear no evil: for Thou art with me; Thy rod and Thy staff they comfort me. Thou preparest a table before me in the presence of mine enemies; Thou anointest my head with oil; My cup runneth over. Surely goodness and mercy shall follow me all the days of my life: and I will dwell in the house of the LORD for ever. I just love the way that King David has used the imagery of a Shepherd and his flock to describe the CARE and COMFORT which every one of God’s sheep can experience. However, it’s not just a group of sheep, but an individual sheep, my friends, Jesus wants to take the greatest care of your life too. He begins by describing the comfort and care of His Lord for him in life. King David LACKS NOTHING, because his Shepherd cares for all of his earthly needs. These two phrases tell me Jesus is concerned about my earthly existence as well as what follows next, my SPIRITUAL life. He leads me in paths of righteousness: “I AM The Way, The Truth and The LIFE: No man comes to the Father except through Me” John 14:6. How does the Good Shepherd lead us? With His ROD (Rod of correction: A small rod that shepherds would use to prod the sheep and keep them on the right path) With HIS STAFF (The STAFF is a bigger stick that shepherds would use to rescue the sheep when they got into difficulty). My friends, Jesus is caring so much for those who become His sheep today. He disciplines, prunes (Luke 15, John 15) He guides (John 16-17 by His Holy Spirit). Jesus, the Good Shepherd, is not just concerned with our life down here on the earth: When we’re going through the doorway of death, He’s right there with His sheep too. DEATH: King David’s Shepherd doesn’t ABANDON Him through death, so he goes on to describe the Lord’s presence in death. Passing through death, David says, is like walking through dark shadows. That would normally be very frightening indeed. I’ve been called out to people who are just about to die and they are petrified, scared to death of dying. They call on a minister out of FEAR: I always come to them and proclaim the Gospel: When faced with DEATH people always REPENT of their sins. Going through DEATH for everyone of us is not pleasant experience, that’s why nobody wants to die. Here we are COMFORTED with this TRUTH: That our LORD JESUS Christ, The Good Shepherd, who provided for all our earthly needs in life, is also with us as we pass through the dark doorway into ETERNITY. For those who are passing through DEATH with Christ, there is NOTHING to FEAR: Why? Because Jesus is right there with us. HOW DO WE GET JESUS TO BE OUR GOOD SHEPHERD? WHILE THIS PSALM ASSURES US THAT GOD IS WITH US AS WE PASS THROUGH THE SHADOW OF DEATH, IT DOES NOT TELL US HOW THIS HAPPENS. King David was specially chosen by God, he was unique and had amazing experiences of God in life and knew and trusted God. But it wasn’t until Jesus came to this world, that ordinary people could also have that same kind of assurance. One thing I am assured about June Bailleau is this, She KNEW JESUS as her Good Shepherd. She’d repented of her sins and trusted Jesus as her Lord. She loved the LORD, and would be singing His praises until her last breath, which I can testify that she did. 11 “I am the good shepherd. The good shepherd lays down his life for the sheep. Notice The LINK: The Good Shepherd: The LORD is MY Shepherd. 15 just as the Father knows me and I know the Father, and I lay down my life for the sheep. (June was assured Jesus had given His life for her). Jesus is the Good Shepherd: He lays down His LIFE for the Sheep. But why? Why did Jesus need to give His life for the Sheep? It’s because without Jesus DEATH on the CROSS: We would all still be in our sins, we would be frightened on our way through the DARK SHADOWS of DEATH. We most certainly would be frightened. We’ve all broken God’s Commandments: Lied, Stolen, Cheated, Disobeyed Parents, Murdered (Hated), Not kept the Sabbath, Not put God first in our lives. God’s Commandments reveal just how much we’ve all sinned. NO SINNER can enter into the Kingdom of Heaven: If we were able to creep into Heaven with our sins still on us, we’d contaminate Heaven. We THINK We’re Good Enough: Most people think they are ‘good enough’. I’m reminded of a time when as a young Electrical Mechanic recruit waiting to be drafted to my first ship, having finished my courses, I was put to work on the Royal Navy Pig Farm: About 40000 pigs to look after: It’s a very smelly affair. You’d only need to be with those pigs for a few minutes and you’d begin to smell like them. After working with the pigs I’d take a shower, spray myself with deodorant and put on clean clothes. Then going to the Dining Hall with all the other Sailors, we’d line up to get in. There was a Petty Officer at the Door: He was controlling the entrance, letting in a few at a time, there were hundreds of us. I noticed there was something strange happening in the queue, there was a gap in front of me and a gap behind, I didn’t take any notice, but when I eventually got to the front of the queue, the Petty Officer said, “Go and get a shower, you stink, you can’t come into the Dining Hall smelling like that”… I was so embarrassed, I’d had a shower, sprayed myself with deodorant and thought I smelled clean, but the stench of the PIGS was still on my body. My friends, I thought I was clean enough, I thought I could get in, I’d cleaned myself up: Oh My friends, there are so many people who’re hoping that they’ll be GOOD ENOUGH to get into Heaven when they pass through the dark shadow of death. They’ll be sadly shocked, because, JUST ONE SIN in your life: Will contaminate your SOUL and you’ll be unfit for Heaven for all eternity. It’s my experience from going out to share the Gospel with folks on the streets every week, people who don’t go to church, people who are not religious, that they do believe in Heaven and they think they are going to be good enough to get in. My friends, we’re encouraged by God’s Word not to fool ourselves: No SINNER can get into HEAVEN. 9 Don’t you realize that those who do wrong will not inherit the Kingdom of God? Don’t fool yourselves. Those who indulge in sexual sin, or who worship idols, or commit adultery, or are male prostitutes, or practice homosexuality, 10 or are thieves, or greedy people, or drunkards, or are abusive, or cheat people—none of these will inherit the Kingdom of God. 11 Some of you were once like that. But you were cleansed; you were made holy; you were made right with God (HOW?) by calling on the name of the Lord Jesus Christ and by the Spirit of our God. Don’t FOOL YOURSELVES: We may think we’re ‘good enough’ but the Bible, God’s Word, reveals that JUST ONE SIN will keep us out of Heaven. Like Adam and Eve, who were banished from God’s presence for ONE SIN, so we too will be sadly shocked and embarrassed to discover, we can’t get in. Thankfully that same passage that tells us not to FOOL OURSELVES, and lists those who can’t get in, it also reveals who can. It’s those who’ve made Jesus their Good Shepherd. When you TURN: In Repentance (Turn away from Sin) Confess your sins to Jesus. When you TRUST: In Christ’s DEATH Upon the Cross, paying the price for your sins. (The Good Shepherd can become your Shepherd today). When you Turn, Trust and Receive Jesus Christ: You will be saved, your sins will be washed away, you’ll be made holy by Jesus Christ’s death and precious blood, you’ll be made right with God and you’ll be free to enter into Heaven. When you die you will not FEAR. When you pass through the Dark Shadows of Death, because Jesus become your Good Shepherd, He will be your Shepherd and He will be with you too. When Jesus Christ is YOUR Good Shepherd. JUNE KNEW Psalm 23 by HEART: June KNEW Jesus as her Good Shepherd: The LORD of her life. You’ll have such a confidence that Jesus is your Good Shepherd, that you’ll KNOW you are just going to go through THE DARK SHADOW of DEATH, you won’t be afraid, because Jesus will be with you, and then once you’ve passed through, you’ll be with Him FOREVER. Death has lost it’s sting, when Jesus is your Good Shepherd. 13 No-one has ever gone into heaven except the one who came from heaven, the Son of Man. 15 that everyone who believes in him may have eternal life. (Those who TRUST that His Death was for their sins). 18 Whoever believes in him is not condemned, but whoever does not believe stands condemned already because he has not believed in the name of God’s one and only Son. It’s NOT ENOUGH to KNOW that Jesus died for your sins: We can all believe that easily enough, but we must TRUST IN Jesus Christ. i.e. Trust that He will forgive you, cleanse you and give you new life, by an act of faith. It’s like a man called Charles Blondin: A World Famous Tight Rope Walker. He would walk across the Niagara Falls with a wheelbarrow. Back and forth (17 Times: Even Blindfolded). Then He asked the Crowd, “Do you believe that I could push a person in a wheelbarrow across the falls?” The Crowd responded “Yes”. The Crowd was silent… He famously pushed his own mother across the falls in that wheelbarrow. She trusted in her own Son, enough to get into that wheelbarrow. My friends, we’ve got to GET Jesus into Us if we are going to be SAVED: Will you TRUST the Son of God? Will you Receive Jesus Christ as your LORD today? He’ll take you across the Dark Shadow of Death all the way to Eternity with Him in Heaven Forever.. Trust Him. Have you made Jesus your Good Shepherd yet? Turn, Trust, Receive Him Today: And you will have HIM with you through life and through that doorway of death too. Amen! I hope you all have a fantastic Friday and wonderful weekend. 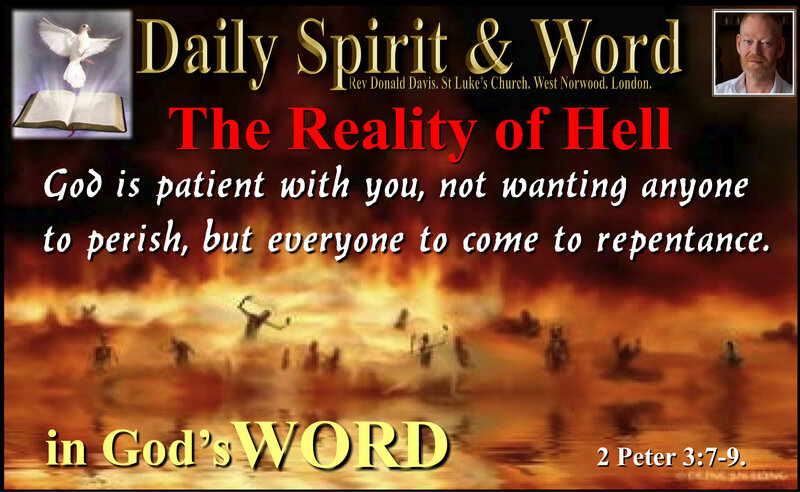 Daily Spirit & Word: 730: The Fire of The Lord. Our God is an ALL CONSUMING FIRE. Good morning my friends, today we’ve got the funeral of a little baby boy called Alexander. He’s the son of Anja and Ledeaux. It’s such a horrific, shocking and sad thing, but I’m so glad that the LORD has revealed Himself to me and that I serve the Living God. Because without Him I’d be totally useless and powerless. Our God is rich in mercy, grace, kindness and love. God is GOOD all the time: Even when tragedy strikes. God’s Prophet Elijah had a contest with the prophets of Baal, it resulted in a great victory for The One True God over the false god Baal. 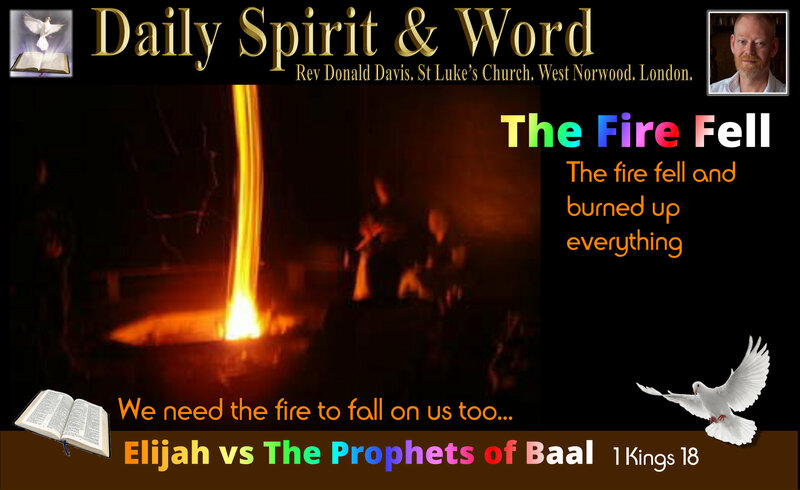 Today God’s Word speaks to us about the fire that ended the contest between Elijah and Baal’s prophets. A) What Prompted The Fire? Notice first the “Then.” at the beginning of our first verse today. You don’t want to miss this my friends. The fire came after some real devout, heartfelt, sincere and solemn praying by Elijah. Sometimes we lack the fire of God in our own walk with Jesus and in our congregations because we neglect this kind of prayer before the LORD. It seems that many of us are more interested in position, place and promoting our church and our ministry that we are in the consuming earnest and sincere close relationship with the One who gave us it all. As a result of this neglect (Puting God first in all things) we’ve lost the FIRE of God in our lives. Elijah knew how to respond to those jeering jibes of the pesky prophets of Baal. Prompted by the Holy Spirit, he called for a contest to see which God is the true God. Can you imagine a Christian follower of Jesus asking some devotees of other faiths to a prayer meeting to see who’s God is real? What prompted God’s fire to fall was His relationship with Elijah. Notice secondly how the POWER of God in the fire CONSUMED. “Then the fire of the LORD fell and burned up the sacrifice, the wood, the stones and the soil, and also licked up the water in the trench.” Oh my friends, the fire that burned like this is not an ordinary or normal fire that you get when you burn wood. It’s akin to the fireball you get in a nuclear explosion, but it fell on Elijah’s little bundle of wet wood and animal sacrifice. It was the FIRE of God and it burned-up EVERYTHING: the sacrifice, the wood under the sacrifice, the stones of the altar, the soil around the altar and even the water which Elijah had put in trenches around the altar. It reminds me today that God’s POWER is the SAME POWER that Created the whole UNIVERSE. It’s the power of God that can do amazing, awe-inspiring, jaw-dropping wonders. I think that we all need this power within us today if we are going to do anything worthwhile for God. That same POWER that Jesus and Elijah had within them is AVAILABLE to us, if we just get closer to the Creator. Jesus spent all night in prayer at times, Elijah prayed and the fire fell. The Disciples were in an upper room praying when the tongues of fire fell upon them (Acts 2). I don’t know about you, but I want that FIRE to fall upon me, we don’t need a Sacrifice like Elijah did, because Jesus is our Sacrificial Lamb of God, but we do need the prayer, when we pray as Elijah did, as Jesus did and as the Disciples did, the FIRE will fall upon us too. C) What More Proof Do We Need? Remember this was a CONTEST: between Elijah’s God and the Prophets of Baal. Elijah said “The God that answered by fire would be the true God.” However, because Baal is not a god at all, he could not answer with fire, but Elijah’s God could because there is NO OTHER God. Jesus gave convincing proofs: There’s PROOF or EVIDENCE enough for me and you today: We don’t NEED to see God to KNOW, the fire still comes when we exercise the gift of FAITH, then we’ll KNOW beyond a shadow of a doubt. What more PROOF do we need? Answer: NONE, because Jesus in me is ENOUGH evidence. But when we know Jesus and stay close to Jesus (John 15), then the FIRE can fall. Did you notice that THE FIRE of the LORD did not burn up the people? It was EVERYTHING but the PEOPLE. This reminds me today of God’s AMAZING GRACE and MERCY: How He has had pity on mankind, not to BURN US, because He, God, could justifiably burn up those people back in Elijah’s day and all of us today. However, instead of the fire burning them it BURNED up everything but the people. Equally, God could easily BURN all of us, but in His richest grace and mercy He has spared us and let the fire of His wrath and anger against sin fall upon His One and Only Son. Jesus took our punishment for us: He died so that we don’t need to face the final fiery furnace of God’s wrath and anger. Our God is an ALL CONSUMING FIRE, but He’s waiting patiently for the right number of people to REPENT, then His final FIRE will fall. (2 Peter 3). 2 Peter 3:3-9 (NIV) God’s Patience. 5 But they deliberately forget that long ago by God’s word the heavens existed and the earth was formed out of water and by water. “The LORD, He is God… The LORD, He is God”… Amen! Don’t let his consuming fire fall on you, but the wonderful FIRE of the Holy Spirit. 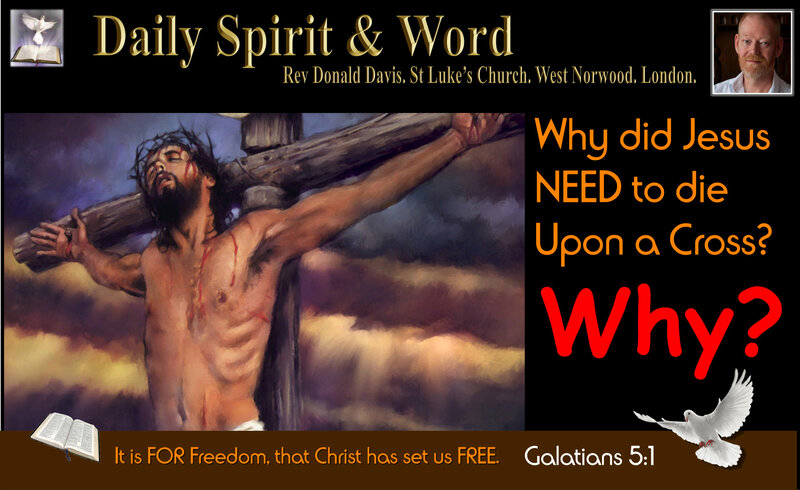 Daily Spirit & Word: 711: Why Did Jesus Need To Die? He came to set us free from sin, self, Satan, God’s wrath and the Judgement to come. Without Jesus Christ’s death upon the Cross, we’d still be; in our sins, rulled by self, slaves to Satan and sin, objects of God’s wrath and anger against sin and ripe for His Holy Judgement to come. If we submit to Christ as Lord and turn from sin and experience His Salvation: Then we’ll escape and be set completely free. David and I led Graham to an awareness of his need for Jesus Christ on Good Friday. We encouraged him to turn from his sin in repentance, letting go of sin and trusting in Jesus, and be saved from God’s wrath to come. To trust in Jesus and His love, when He gave His life upon the Cross, taking our place and dying for us. Graham thanks us for showing him why Jesus needed to die upon the Cross. Yesterday was a Good Friday for Graham. Have an AWESOME Easter Weekend. Note: Graham was enslaved by sin and he didn’t even realise it. There are so many, countless thousands, who are unaware of their need of Jesus Christ. They are trapped in all kinds of sin and wickedness that offends a Holy and Righteous God, they are storing up His wrath for the Day of Judgement. They don’t know why Jesus needed to die upon the Cross, but it was for our FREEDOM that Christ has set us free. Jesus wants to set people free today. So let’s be prepared at all times to share the Greatest News they are ever likely to hear, they’ll thank you when they meet you in Heaven. Praise the LORD for Gospel conversations. What a walk of witness too, so many came from all over West Norwood, Dulwhich and Tulse Hill. I’m praying now that next year we’ll have to close off the road because of the multitude of souls walking for Jesus. Amen! 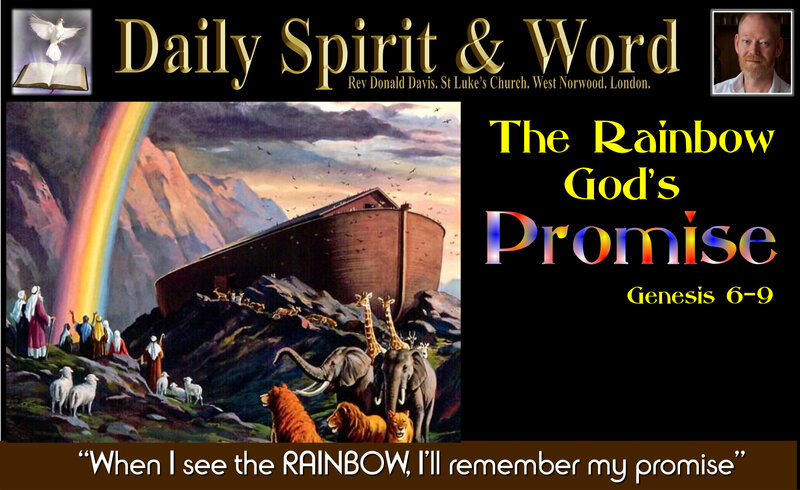 Daily Spirit & Word: 660: The Rainbow Is God’s Promise. 15 I will remember my covenant between me and you and all living creatures of every kind. Never again will the waters become a flood to destroy all life. Good morning my friends, my heart goes out to all those who’ve been flooded here in the UK over the last few weeks. There’s been terrible storms and thousands affected by the weather. Not just in the UK but all over the world. God’s PROMISE is still true though, He’s NOT going to destroy the whole earth with a flood. I’ve been reading my Bible again today. It’s the second day of 2016 and I’ve been reading from God’s Word about Noah, the Flood and God’s Covenant Promise; Genesis chapters 6-9. But why did God send a flood upon the whole Earth to destroy every living creature? The only life that was saved was Noah, his sons and their wives and his own wife, along with two of every creature with breath. Why did God decide to destroy everyone else? 5 The LORD saw how great man’s wickedness on the earth had become, and that every inclination of the thoughts of his heart was only evil all the time. 6 The LORD was grieved that he had made man on the earth, and his heart was filled with pain. He sees your thought life as well as your actions. Some people imagine that it’s OK to look with lust, “There’s nothing wrong with window shopping” they say. “You can look and enjoy, as long as you remain faithful”. But God sees our thoughts and the inclination of our hearts that “every inclination of the thoughts of man’s heart was only evil all the time”… It’s NOT OK to lust, for God sees lust as adultery. The reason God destroyed the Earth in those days: “The LORD was grieved that He had made man on the Earth and His hears was filled with pain.” Gen 6:6. He was grieving: He was hurting: Why? Because of all the creatures that God had made, only mankind was made in His image. He made us like Himself, yet men decided to go their own way, to do those things they knew God didn’t like. Evil inclinations hurt and offend God. NOTE: There was ONE man, just one man, who walked with God. Noah. Imagine that, over all the Earth there was just one man who was righteous in God’s eyes. So God made a plan that He would save Noah and because of Noah’s righteousness, God would also save Noah’s wife, sons, their wives. Even though they were just as bad as everyone else, but because of that ONE MAN’S righteousness, Noah’s family gets saved too. Remember Lot, how Sodom and Gomorrah were saved for a while because of that ONE righteous man living amongst them, God had to pull Lot out of Sodom before he destroyed it. God shut Noah in the Ark before He destroyed everyone else on the Earth, but along with Noah God’s GRACE extended to his family. Who knows, God may be SAVING your family right now because of your faithfulness to Jesus Christ today. God may be saving your city or town, but because you belong to Jesus. God may be saving your Nation because there is ONE man or woman who’s righteous in His sight. The Rainbow: It’s God’s promise to us and a reminder to Himself, that He’ll not destroy the earth with a flood again. WOWzer! God knows our hearts, He knows just how we think, but in His GRACE and MERCY He’s chosen NOT to destroy the Earth with a flood. 21 The LORD smelled the pleasing aroma and said in his heart: “Never again will I curse the ground because of man, even though every inclination of his heart is evil from childhood. And never again will I destroy all living creatures, as I have done. The next time that God will destroy the Earth and the Universe with it, it will be with FIRE: Not with a flood. Until the Judgement: We have His promise NEVER AGAIN to destroy the Earth with a flood. “Even though every inclination of mankind’s heart is evil from childhood”: That’s God’s GRACE, MERCY and LOVE. In the MEANTIME: God is PATIENT. He sent Jesus Christ to rescue us, just as He provided an ARK for Noah, God’s provided Jesus Christ: So that those who enter into Him will be SAVED from the Judgement to come. Yes God’s judgement is coming, like Noah’s day, we don’t know the hour or the day, but we KNOW for sure it’s coming. We can see that people all over the earth today are like they were in the time of Noah, but God’s grace and mercy and His patience are keeping people alive. He’s giving mankind a chance to enter into His ARK: His One and ONLY Son: Jesus Christ. Walk with Him as Noah did. Remember the RAINBOW; God’s promise. Remember the ARK; God’s gracious provision and escape from Judgement. Remember Jesus; God’s way to escape the coming judgement. Remember God’s GRACE: in the Meantime. The Rainbow is a sign of God’s PROMISE not man’s pride, He’s patient not wanting ANYONE to perish, but everyone to come to repentance. Trust in Jesus Christ: God’s SAVING ARK today. 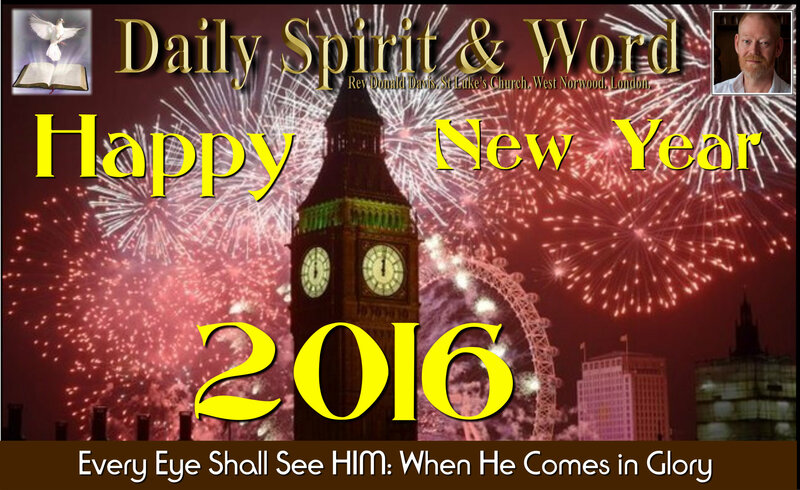 Christian Greetings for a truly Blessed New Year in 2016. 7 Look! He comes with the clouds of heaven. And everyone will see him— even those who pierced him. And all the nations of the world will mourn for him. Yes! Amen! It was awesome looking out my window just now, watching the beautiful fireworks ushering in the New Year of 2016. Almost everyone in London would have been able to hear them, and I hope also see them. WOWzer! so many fireworks. It reminded me of that wonderful promise in so many places in the Bible, that when Jesus comes back again, He’ll return in Glory and EVERY Eye shall see Him. It’s my hope and prayer that you’ll all be able to KNOW Jesus Christ NOW: Long before He comes back to judge the living and the dead. That you’ll KNOW Jesus as LORD before the appointed hour. I’m singing and praising Jesus now. Great things He has done. Have a fantastic 2016 with Jesus. May you all have: Hope, Peace, Joy and LOVE in abundance this coming year. Be blessed in all you do. Be blessed in all you are. Be blessed in Jesus our Lord and Saviour. Daily Spirit & Word: 636. It’s God’s Call. Having a deep care and concern for the Eternal Welfare of others. My voice finally gave up last night, it had been cracking for a few days, but now it’s getting painful to speak. I’ve been told to stop. My wife thinks that’s brill, because now I can just sit and listen to her for ages. But I want to go back to the reading from yesterday in Isaiah 6, where we looked at the Trinity Revealed, but now I want to focus upon the calling of Isaiah and the dreadful message he was entrusted to deliver. 1 In the year that King Uzziah died, I saw the Lord seated on a throne, high and exalted, and the train of his robe filled the temple. 2 Above him were seraphs, each with six wings: With two wings they covered their faces, with two they covered their feet, and with two they were flying. 6 Then one of the seraphs flew to me with a live coal in his hand, which he had taken with tongs from the altar. 12 until the LORD has sent everyone far away and the land is utterly forsaken. We could be left with the impression it’s as if the “calling” is something that belongs to them. However, if we’ve been called by the LORD to do something, then we should always be aware, as Jesus was, as Isaiah was and so many other Biblical Characters were, that it is God’s CALL. It’s HIS from start to finish. Give glory to Him always. Isaiah knew enough about the LORD God Almighty, that if a person saw God that person would die, because of His sinfulness. Exodus 33:20. Moses could see God’s glory and God’s back, but he couldn’t look into God’s face and live. NOTE: The Altar in Heaven: The Altar of Incense: Live coals were taken into the Holy of Holies to burn incense before the Lord. The Altar is a place of sacrifice: So we must ask the question, what sacrifice had been made in Heaven that could atone for Isaiah’s sins? Who or what died in Heaven? It might just possibly be an indication or prophetic look at God’s own sacrifice for the sins of all mankind: He gave His own beloved Son to die for everyone’s sins. Isaiah must have experienced an immediate inner change when he had the vision of God in Heaven and when the Angel took the coal from the fire on the Altar and touched his mouth. When he hears the invitation of God, he volunteers immediately to go and serve (6:8). God’s response is also immediate. Note that God does not provide many specific details of Isaiah’s ministry, but the severity of his mission is clear. He is being sent to people who will not listen or respond to him, yet he is to continue his work until their nation is destroyed. God’s just judgement is imminent and it’s coming upon Israel. NOTE: The Live Coal: Fear of Fire. When I was a boy growing up in Edinburgh in the 1960’s we had a coal fire. From a very young age I’d watch my father set the fire and help him too. He’d get the crunched-up paper, the sticks, the coal and match to set it ablaze. Sometimes he’d hold a sheet in front of the fire to cause a draught in at the bottom, which speeded up the process of getting the fire going. Then after a while, the coals in the fire would be glowing bright red. What a fire. My dad said to me, “Don’t ever touch a fire, you see those red coals, DON’T EVER TOUCH A RED COAL”. I said, “Why dad, they look like lovely jewels?” He explained, “Because they will hurt you so much and you’ll be in agony. You’ll be crying louder than you’ve ever cried. Remember how much your knee hurt when you came off your bike? This will hurt so much more than that”. I’m so grateful that my dad warned me of the dangers of fire. He put the FEAR of FIRE in me. I didn’t hate my dad when He told me that the FIRE AND THE COALS would hurt me, I was only left with the impression that my dad loved me and didn’t want me to get hurt. Similarly; When an Evangelist warns of THE FIRES OF HELL he’s only showing how much he loves you. Also that God loves you and doesn’t want anyone to perish in Hell. But burning hell fire is real and it’s reserved for everyone, EVERYONE, who dies in their sinful condition: Why? Because NO ONE CAN SEE GOD and LIVE. My friends, God has warned us in many ways about the dangers of sin and the consequences of sin: Jesus warned us so many times in the Gospels. Hell is real: It God’s punishment for sin, but He doesn’t want to have to send anyone there, but He will. Because of His justice, sin must be paid for. God wants to GIVE YOU ETERNAL LIFE so that you can live forever. 2 Peter 3:7-9 Warning & Yearning. 7 By the same word the present heavens and earth are reserved for fire, being kept for the day of judgment and destruction of ungodly men. 8 But do not forget this one thing, dear friends: With the Lord a day is like a thousand years, and a thousand years are like a day. 9 The Lord is not slow in keeping his promise, as some understand slowness. He is patient with you, not wanting anyone to perish, but everyone to come to repentance. We hear from Peter about God’s Patience: Not wanting anyone to perish. He’s extending His Divine offer of Grace, Mercy and Forgiveness for as long as we live: However, the moment we die, the time for God’s GRACE has ended. There’s no chance after death for; mercy, repentance, forgiveness. NOTE: Jesus Doctrine of Hell: His teaching (that’s what doctrine means). In Luke’s Gospel we’re given a picture from Jesus of what HELL is going to be like, and it’s NOT a place that you’d want anyone, even your worst enemy, to end up in. 21 and longing to eat what fell from the rich man’s table. Even the dogs came and licked his sores. 22 “The time came when the beggar died and the angels carried him to Abraham’s side. The rich man also died and was buried. 23 In hell (Hades), where he was in torment, he looked up and saw Abraham far away, with Lazarus by his side. The Rich Man: In Hell “I am in agony in this fire”. Hell is a FIXED State for anyone, everyone, who dies in their sins. I was at the movies a while ago and noted throughout the movie: EXIT signs, they were bright and clear in the darkness as the movie played. If a fire broke out in the Cinema I’d know how to get out of the fire. There’s no way out of HELL. No EXIT: It’s as if the EXIT sign has been removed from Hell. (A great chasm has been FIXED). THE DESIRE TO WARN OTHERS. Once the Rich man realised his eternal condition, his heart wanted to WARN others, especially his family members. Once Isaiah was “cleansed of his sins” his desire was to be the one that God would send with His message. Isaiah, was given a message from God to deliver. It was a WARNING of impending JUDGEMENT. He was to deliver it to a people that would not listen and would not turn to the LORD. Christians, have been ENTRUSTED BY GOD with the same kind of message: REPENT OR PERISH. TURN OR BURN. THE WAGES OF SIN IS DEATH. HELL AWAITS THE ONE WHO HAS SINNED. Thankfully many do heed the warning and turn to the LORD in Repentance. It’s not a nice message to deliver and many shrink from the calling. It’s such a horrific message, that many attempts have been made over two thousand years to WATER IT DOWN (Quench the fire a bit). It’s like asking Lazarus to dip the tip of his finger in water to cool my tongue. The Church has, instead of warning people, emphasised the benefits of heaven. But unless people KNOW why they need Heaven, they are unlikely to truly REPENT OF THEIR SINS. Unless or until a person comes to Christ, then Hell awaits every sinful soul. Jesus DID come back from the DEAD: People still won’t listen. However, we’ve been entrusted with God’s message of RECONCILIATION. (2 Corinthians 5:11-21). He wants every believer in Jesus who’s been born of His Spirit to be a PROPHET to the World, God’s Ambassadors who’ll deliver His message of Good News: That no one needs to perish in Hell forever. 2 Corinthians 5:11, 17-21. The Ministry of Reconciliation. 11 Since, then, we know what it is to fear the Lord, we try to persuade men … 17 Therefore, if anyone is in Christ, he is a new creation; the old has gone, the new has come! 18 All this is from God, who reconciled us to himself through Christ and gave us the ministry of reconciliation: 19 that God was reconciling the world to himself in Christ, not counting men’s sins against them. And he has committed to us the message of reconciliation. 20 We are therefore Christ’s ambassadors, as though God were making his appeal through us. We implore you on Christ’s behalf: Be reconciled to God. He didn’t know what the message was until he responded to the call. We know the message, we know the call, we’ve been commanded to go into all the world and deliver God’s message of reconciliation. Will you Go for God into the world today and deliver His LOVING HEART: His message of reconciliation. Will you WARN people that if we touch the fire it will hurt us? If you’ll do that to warn your own children and friends about earthly fire, surely we should be just as concerned about the Eternal Welfare of everyone on the earth today as well. The Day of Judgement will come, Jesus is coming back soon, let’s save as many as we can. You know BIBLE means; Basic, Instructions, Before, Leaving, Earth. Let’s get God’s message out into all the world, so that everyone has an opportunity to turn in faith and repentance and avoids the punishment of Hell. 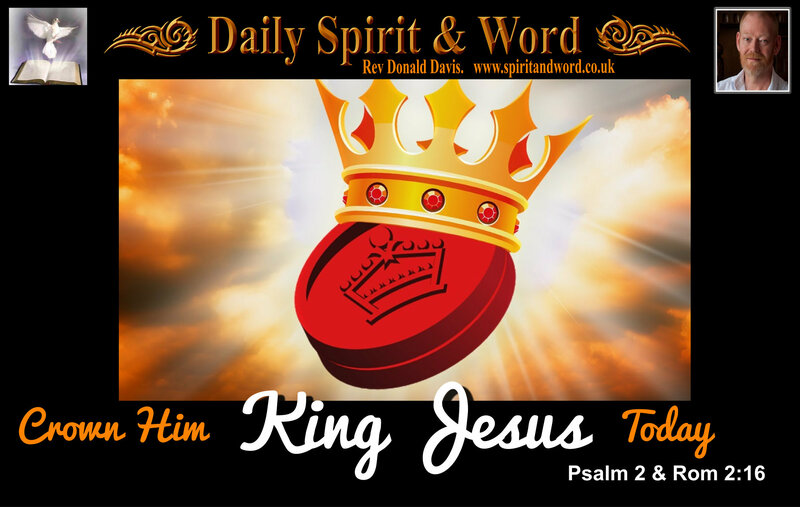 Daily Spirit & Word, 615: Crown Him King. Good morning my friends, have you ever played the game called Checkers? It’s one of the easiest games in the world to learn and can take a lifetime to master. The idea is to move your pieces and get as many on the opponent’s base-line, then you can say “Crown Him”. Once you get them crowned king, then you’ve got a King (doubler) you can move about the board in any direction. It’s marvellous to teach children, even very young ones get-it quite quickly. A word of caution (do let them win – they love it when they beat you at games). Who Is this “SON” in this Psalm? 7 I will proclaim the decree of the LORD: He said to me, “You are my Son; today I have become your Father. 8 Ask of me, and I will make the nations your inheritance, the ends of the earth your possession. The SON is KING Jesus. Though The World (People who are not yet Saved by Jesus) is king at the moment. There will come a DAY of reckoning: Psalm 2:4-6. God just laughs my friends. He’s laughing at a World that thinks it’s King. A world that has little room for Jesus now, will one day have to bow the knee. A world that educates our children away from God’s values and standards. A world that criminalises followers of Jesus for teaching His moral absolutes. A world that gathers against Jerusalem, is a world that’s going to get crushed. A world that grumbles, throws off the chains of righteousness, for they think God’s standards are like a prison. God Gives Them Over – He Let’s them think they are winning (But He’s Laughing at a foolish world that thinks it’s king). Romans 1:18-32 God Lets Them Think They Are Winning. 18 The wrath of God is being revealed from heaven against all the godlessness and wickedness of men who suppress the truth by their wickedness, 19 since what may be known about God is plain to them, because God has made it plain to them. 22 Although they claimed to be wise, they became fools 23 and exchanged the glory of the immortal God for images made to look like mortal man and birds and animals and reptiles. 25 They exchanged the truth of God for a lie, and worshipped and served created things rather than the Creator—who is for ever praised. Amen. 28 Furthermore, since they did not think it worth while to retain the knowledge of God, he gave them over to a depraved mind, to do what ought not to be done. 29 They have become filled with every kind of wickedness, evil, greed and depravity. They are full of envy, murder, strife, deceit and malice. They are gossips, 30 slanderers, God-haters, insolent, arrogant and boastful; they invent ways of doing evil; they disobey their parents; 31 they are senseless, faithless, heartless, ruthless. 32 Although they know God’s righteous decree that those who do such things deserve death, they not only continue to do these very things but also approve of those who practise them. (And NOW: They are criminalising those who say anything against these sinful, depraved and wicked practices). The KING’S DAY: (Soon and Very Soon). Though The World (People who are not yet Saved by Jesus) is king at the moment. God is laughing at them, scoffing at them, but one day His wrath will be revealed from Heaven. Watch out when Jesus is CROWNED KING. There will come a DAY of reckoning. Jesus will be Crowned KING. So my friends, Don’t give up or give in; stay focused and fixed upon Jesus Christ. 1 Therefore, since we are surrounded by such a great cloud of witnesses, let us throw off everything that hinders and the sin that so easily entangles, and let us run with perseverance the race marked out for us. 2 Let us fix our eyes on Jesus, the author and perfecter of our faith, who for the joy set before him endured the cross, scorning its shame, and sat down at the right hand of the throne of God. 3 Consider him who endured such opposition from sinful men, so that you will not grow weary and lose heart. Be blessed TODAY: Enjoy Checkers, enjoy Rugby and Sports (even if your team looses), but KEEP your eyes FIXED on KING Jesus. Crown Jesus Your KING Today. King over; your home, finances, work, career, prospects, hobbies, likes and desires, family and friends. Jesus wants to be the KING (LORD, Boss, Master) of your everything. Let Him be your KING and you’ll find COMPLETE FREEDOM. 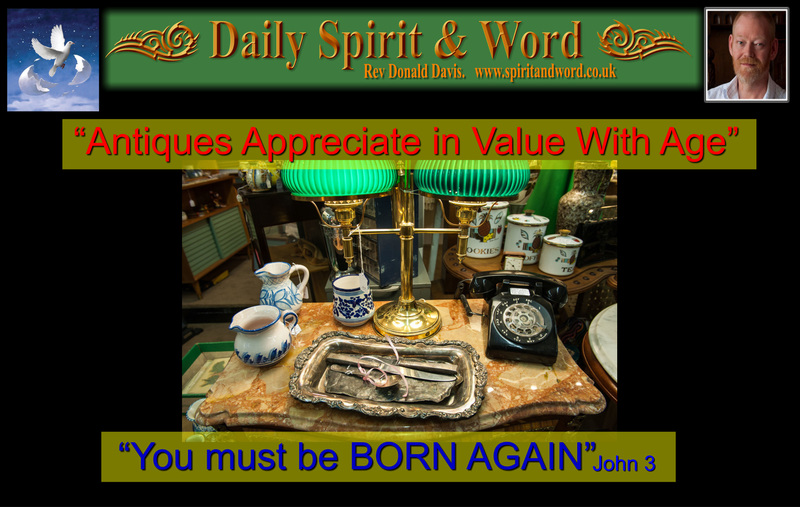 Daily Spirit & Word 565: Antiques Appreciate With Age. It was one of those nights again, I had another dream that I believe was from the LORD. I don’t know who it’s for though, so I’m just sharing it generally for all to enjoy. In the dream, I was upstairs in an old dusty attic loft, with wooden balustrades and open slatted bannisters. There was a very good looking woman (I know who she is), who was acting like a Princess (in her own eyes), but everybody else thought she was a grown-up-spoilt-brat of a woman. Over the years she’d used her good looks to get what she wanted in life; the best boy in school, the best and biggest circle of friends were attracted to her, because she was bright, intelligent and politically lethal. Of course she had money and she was daddy’s little girl, even though she was a grown-woman and married. The woman in my dream was born into a family with a strong Evangelical tradition, she’d been brought up to go to church, was the sparkling gem of a child, who because of her family heritage was even spoilt in Sunday School. (Spoilt means = Having the character or disposition harmed by pampering or oversolicitous attention) and you know how she turned out, but there is real HOPE: Because that woman became a born-again believer in the LORD JESUS CHRIST. She is just as on-fire with the Holy Spirit today as her ancestors were. What happened? She met Jesus for herself: Repented, Received Him as Lord and got baptised. My friends, you cannot be born a Christian, you must be born-again. You cannot be a Christian because Granny was a strong believer or Grandaddy was an Elder or Deacon in the Church; you must be born-again yourself. You cannot get born-again, by just attending church, being baptised, going to Sunday School or taking Holy Communion. No my friends, you too must come to believe that Jesus died upon the Cross for your own sins, all those Commandments of the LORD that you’ve broken will one day land you in Hell, unless you too repent and trust the Saviour for your Salvation. Why? Because God must punish sin and until you come to the Saviour in repentance and faith, you are carrying your own load of sin. You’ll carry it all the way to the judgement unless you hand it over to Jesus at the Cross. Time is short, time is running out, each day that passes is one more step towards Eternity. So take the leap into Jesus arms right now, and let Him catch you before you fall into the pit of Hell. Be certain today that you’ve turned from your sins, stop trusting in your own goodness and begin trusting in Christ’s goodness to save you from God’s wrath to come. Ardian Rogers explains it so clearly; “All sin will either be pardoned in Christ or punished in hell. No sin and no person who sins will slip by, adjudged.” Adrian Rogers. Love Worth Finding. “All sin will either be pardoned in Christ or punished in hell. A ‘faith’ that’s handed down from one generation to the next, without becoming personal and real, is no faith at all. No wonder so many people who think they are Christians because their family were strong believers, are treating their faith as if it’s an encumbrance or an embarrassment. My friends, when you KNOW Jesus, your faith in Him is valued above everything else in life. You’ll treasure your Bible because you’ll know it’s God’s love letter to you. That He speaks to you through it’s pages and guides you in life and corrects your thought and desires. You’ll long to gather with the brothers and sisters to worship with all your heart and sing your praises to the Lord until it hurts, because you love HIM. You long for and look for opportunities to share you faith with others and spread the good news, because you can’t bear the thought of anyone, even your worst enemy, spending one moment in Hell with the Devil. You’ll also look for ways to be used by the LORD for good in the world. Instead of avoiding the poor, the weak, the lame and the outcast, you’ll search them out an help them. Why? Because you’ll be filled with the LOVE of the LORD. You’ll look for and desire to be filled with God’s Holy Spirit every day and moment by moment throughout each day of your life; Why? Because you know that trying to get by in your own strength and ability leads to spiritual failures. As you grow into an old Saint in Christ my friends, growing up in that kind of faith, then you too will become a treasured antique; treasured by your fellow saints and by the LORD Jesus Christ. God bless and I hope you all have an AWESOME weekend. (Now I can go back to bed, it’s only 2.45am 😎 😆 😛 ). Prayer: Dear Lord Jesus Christ, I thank you that I am fearfully and wonderfully made (Psalm 139), that you’re calling everyone out of darkness into your marvellous, magnificent, amazing light. Please help me today to be the person You want me to be. Fill me with the Holy Spirit Lord, because I need Your power to live each moment for You. Amen! (Don’s Side-Note: Each one of us has broken at least one of God’s Commandments; lying, stealing, lusting, cheating, coveting, dishonouring our parents). HOW do we get to be ‘righteous’? 2 Corinthians 5:21 “For He [God the Father] hath made Him [Jesus Christ] to be sin for us, Who [Jesus] knew no sin; that we might be made the righteousness of God in Him [Jesus]. (Don’s Side-Notes: We become righteous in Christ the moment we receive Him as our Saviour after believing that He died on the cross for our sin and rose from the dead to show that God the Father was satisfied with His Sacrifice for sin, then we repent (turn from all sin in our life) and receive Him as our Lord). There are NO second-hand Christians, only first-hand Believers. You can be purchased (redeemed) by Jesus today. The Gospel Good News of Jesus Christ. Adrian Rogers Study on The Judgement Seat of Christ.